Cities have always played a vital role in the national economy, but in the past few years their importance has increased. Last month, we highlighted the “Dow of Cities”—how the rising value of housing in the most central portions of the nation’s metropolitan areas signals the market’s verdict about the growing demand for urban living. Another indicator comes courtesy of our friend Josh Lehner, an economist in the Oregon Office of Economic Analysis. Josh uses Bureau of Labor Statistics employment data to track employment growth by size of metropolitan area. His analysis divides the nation into four groups: the 51 metropolitan areas of 1 million population or more, two groups of mid-sized and smaller metropolitan areas, and nonmetropolitan America. There’s no question that large metros are important to the economy. These 51 metros with a million or more population are home to 168 million Americans, and account for about 65 percent of the nation’s gross domestic product. But the big question is, how important are they to national growth? The latest data show that, as a group, large metropolitan areas have dramatically out-performed the rest of the country in the last economic cycle (dating from the peak of the economy in December 2007). 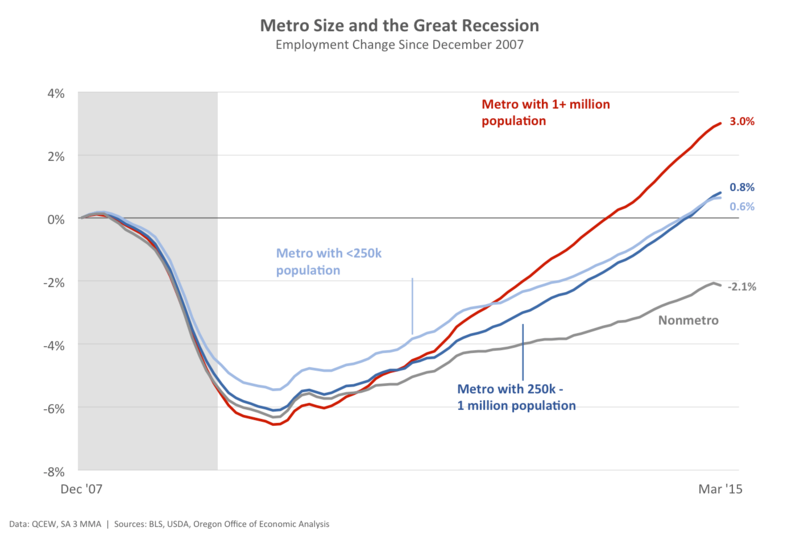 In the aggregate, metros with 1 million or more population have fully recovered the employment lost in the Great Recession, and grown to 3 percent above their pre-recession peak. As of March 2015, smaller and mid-sized areas had barely made it back to the peak. And non-metropolitan America is still 2.1 percent below where it was in 2007. What makes this finding even more striking if one cares about cities is that it represents a dramatic shift from the pattern of the last economic expansion. 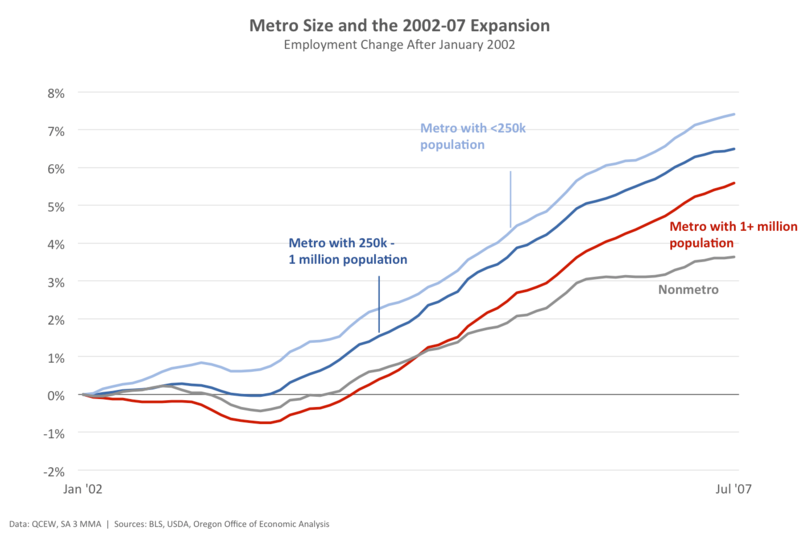 Using Josh’s data, we prepared a second chart, showing the growth in employment for large, middle-sized and small metros and non-metros, for the period 2002 through 2007. During that growth period, small and mid-sized metros decidedly out-performed larger metros in job growth. The smallest metros grew their employment by 7.5 percent, mid-sized metros grew about 6.5 percent, and large metros grew about 5.5 percent. As we’ve pointed out in our report, Surging City Center Job Growth, the last few years have witnessed a historic reversal in the patterns of job growth within large metropolitan areas. After decades of steady decentralization, employment growth in urban centers substantially outpaced that in more peripheral locations from 2007 through 2011. We think there’s strong evidence that this process is driven by employers looking to tap the growing labor market in city centers, which itself is a product of the movement of well-educated young adults back to cities (as we documented in Young and Restless). All this evidence points to one thing: City centers are the big drivers of national economic growth. Big metros are significantly out-performing smaller metros, which in turn are out-performing rural areas. Within large metros, the decades-long pattern of job decentralization has reversed—and jobs are growing faster in city centers than in the metropolitan periphery. In this economic expansion, the nation’s economic growth is tied to the performance of its large metros and their robust city centers. Many thanks to Josh Lehner for compiling this data and sharing it. Be sure to visit the Office of Economic Analysis blog for more detail, including a national map showing patterns of county-level job growth since 2007.